Alice in Wonderland is Tim Burton’s most visually ambitious movie to date and, especially after dreaming up $1 billion at the global box office, it deserves a Blu-ray release with much more muchness. Three-disc set includes Blu-ray, DVD, and Digital Copy, as well as a collection of 12 behind-the-scenes featurettes. Burton’s Alice in Wonderland is not a live-action remake of the 1951 Disney classic. Nor is it an adaptation of Lewis Carroll’s books. It’s essentially an original follow up written by Linda Woolverton, herself no stranger to Disney’s historic animation catalog, with Beauty and the Beast, The Lion King, and Mulan among her credits. Even with that pedigree, there’s no doubt this fairly dark tale will irritate some purists who deem Disney’s take from nearly 60 years ago as the penultimate in storytelling. Very much in the absurdist, fantastical vein of Carroll’s 140-year-old source material, this new, high-tech fractured fairy tale also offers a solid message underlying all the eye candy. It is, ultimately, about a girl finding – and being – herself. And there are loads upon loads upon loads of eye candy in this potpourri of eye-popping pleasures. From the outset it’s clear Burton cast the right girl for Alice. Mia Wasikowska (Amelia) brings the 19-year-old Alice to life; she’s a little rebellious and certainly not one to do things just because society says that’s how things should be done. Just who in the upper classes dictated that corsets were “proper attire” anyway? And does she really have to marry the much-too-prissy Lord Hamish? The bigger problem is Alice, a perpetual dreamer, continues to be haunted by nightmares of blue caterpillars, talking bunnies, and mad hatters. The same dreams she had 13 years earlier, when she first visited Wonderland. She’s also still a bit downcast following the death of her father, a man she revered, a man who didn’t waste his time thinking small. As a child, her father reassured her following her nightmares that she has indeed “gone around the bend.” She’s mad, bonkers, off her head. Like all the best people. In need of escape after hearing Lord Hamish’s proposal, Alice finds herself goaded on by a pocket watch-carrying bunny and down the hole she goes again. Once back in her old stomping grounds, her identity is questioned by Absolem, the hookah-smoking caterpillar (Alan Rickman, Severus Snape in the Harry Potter series). Is she the right Alice? She’s certainly not the same Alice they met 13 years earlier. Alice in Wonderland covers some familiar action turf; amid her own identity crisis, Alice is thrust into the middle of sibling rivalry taken to a whole new level. Alice must slay the Red Queen’s pet Jabberwocky in order to restore the White Queen’s rule and free the people of Underland (the naïve, younger Alice kept misnaming it as Wonderland). Putting Lewis Carroll’s characters in Tim Burton’s hands is like giving Pop Rocks and soda to a five-year-old. In Burton’s vision, the Red Queen (Helena Bonham Carter, Bellatrix Lestrange in the Harry Potter series) is burdened with a “regrettably large head,” surrounds herself with others displaying grossly exaggerated body parts, and rests her sore ankles on the belly of a pig. She questions whether it’s better to be loved or be feared. As for the White Queen (Anne Hathaway, Get Smart), it’s against her code to harm a fly and she moves with all the overdone gracefulness expected of royalty with nothing to do other than look royal. Burton’s clearly in his comfort zone as he revels in the bizarreness of it all. And he’s also surrounded himself with a cast he’s worked with before, including Depp (a seven-time collaborator, with Dark Shadows next on their horizon), Carter (five-time collaborator, significant other, and producer of Burton’s children), Michael Gough (Alfred in Burton’s two Batman movies), as well as Timothy Spall and Alan Rickman returning from the Sweeney Todd cast. For a director whose early work included the black-and-white short Frankenweenie, then heavily leveraged stop-motion animation in goofy, original movies like Pee-Wee’s Big Adventure and Beetlejuice, Burton has risen up to the top ranks of truly visionary directors. Many grouse about his storytelling sensibilities, but there’s simply no denying a Tim Burton movie is a unique and visually-exciting work of art. Alice in Wonderland is no exception. Burton plumbs his boundless imagination and fills the screen with a smorgasbord of ideas and gorgeous imagery. Present on both the Blu-ray and DVD discs are three of the set’s best featurettes. The Mad Hatter: A must-see for Johnny Depp fans, this one offers some great insight courtesy of Depp, whose character research uncovered the fact that, back in the day, hatters used a glue made with a high level of mercury, enough to make the hatters go mad. Also included are character sketches by both Depp and Tim Burton. Finding Alice: A good look at the girl who lost her muchness and the actress who portrays her. Effecting Wonderland: Lots of green screen footage, including Crispin Glover in a green leotard, walking around on green stilts. This segment also takes a look at all the image manipulation and computer trickery that gave the movie it’s fantastic look and brought the Tweedles to life. The third disc of the three-disc Blu-ray/DVD combo pack holds a digital copy of the movie for use on computers or portable devices. There are an additional 9 featurettes exclusive to Blu-ray. Collectively, all 12 featurettes total roughly 48 minutes. While the quality of the content is good overall, the set doesn’t fulfill the promise of the Blu-ray format. Yes, the movie’s presentation quality is superb, but the technology available should also make the supplements superb, such as with a picture-in-picture commentary track that could’ve shown all sorts of sketches from Burton, Depp, costume designer Colleen Atwood, production designer Robert Stromberg, along with green-screen comparison footage, and other glimpses behind the scenes of this unusual production. It’s worth noting the June 1 home video release date was announced shortly before the movie’s March 5 theatrical release. The movie has since gone on to gross more than $1 billion worldwide. With that kind of success, it’s reasonable to expect the Mouse House put a little more pixy dust on the home video edition. But, given the increasingly short release windows, there’s less and less time available to adjust home video production budgets and give what turns out to be a much bigger-than-expected blockbuster proper home treatment. Then again, it’s no doubt an excuse for a double dip down the road, perhaps offering exclusive fodder for the almost inevitable Blu 3D release. Here’s a rundown of the Blu-exclusive featurettes, each running roughly 3-6 minutes. The Futterwacken: Who knew, after singing in Sweeney Todd, Depp would be “freaked out” about dancing? Thankfully, dancer David “Elsewhere” Bernal was found on YouTube and located via MySpace. Turns out, he was only 40 minutes away. Much amusement is had simply in speaking the word “Futterwacken” while people discuss the creation of the Futterwacken’s fluid motion style. The Red Queen: This one includes a hilarious painting of the Red Queen with a nasty scowl on her face, painted in the Dutch Masters tradition. Time-Lapse: Sculpting the Red Queen: Watch Helena Bonham Carter transform into the big-headed queen. The White Queen: Anne Hathaway discusses the process of developing the White Queen’s look and flighty mannerisms, including some interesting insight into her character’s psyche. Scoring Wonderland: The Burton-Elfman collaboration continues and this offers an enjoyable look at Elfman’s creative process. Stunts of Wonderland: The title says it all. This one’s about the stunts, using plenty of wires in front of those green screens. Making the Proper Size: This one sizes up the sizing issue; it’s a short look at the blending of old school and new school techniques. Cakes of Wonderland: A sugar-coated look at the delictables served on the table at the tea party. Tea Party Props: All those cakes and table settings, some 150-pieces having to be reset 12 times during the filming of the tea party scene. As an odd little addition, the main menu, styled after the Oraculum, includes the forecasted temperature, in both celcius and fahrenheit. While this release’s Blu-ray supplements leave a lot to be desired, the quality of the feature presentation is spot on. Given all the stunning visuals on display and the incredible level of detail in Burton’s imaginative characters, Alice in Wonderland is the kind of movie that showcases the strengths of the Blu format. The movie is presented in a 1.78:1 aspect ratio. Optional subtitles are available in English SDH, French, and Spanish. 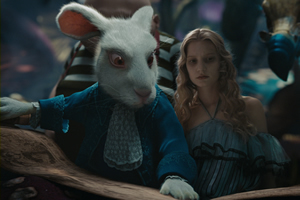 Check out The Mad Hatter featurette then watch Alice in Wonderland and enjoy Tim Burton’s unique vision.